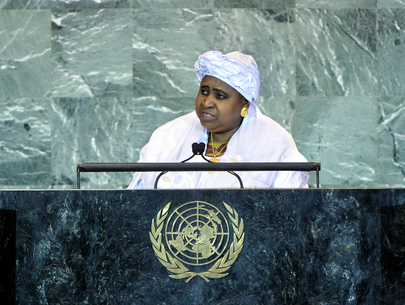 AJA ISATOU NJIE-SAIDY, Vice-President of the Gambia, said her delegation was a strong believer in the role of mediation as a conflict prevention mechanism at both the national and international levels. In the experience of West Africa, mediation produced results and Gambia had consequently instituted an alternative dispute resolution mechanism to settle conflict between and among its peoples and institutions. As recent conflicts in Guinea and Guinea-Bissau showed, regional ownership of the mediation process was also essential. Thus, the international community should give priority to mediation in any conflict before using threats of military invasion or outright military intervention. Although West Africa enjoyed relative peace, spoilers had not given up attempts to derail that peace, she said. The evils of drug trafficking and the trafficking of illicit goods and arms had reared their heads across the subregion and swift international action must nip them in the bud, before it proved too late. As those crimes fed on each other and sowed the seeds of terror, economic sabotage, and the collapse of social order, resources must be pooled to boost detection, surveillance, law enforcement and prosecution. A framework for cooperation was also needed, as was the international community’s support. Saluting the leadership of Sudan for implementing the Comprehensive Peace Accord, which led to South Sudan’s independence, she encouraged both sides to invest in their shared future through a negotiated settlement of all pending issues. She also encouraged Guinea and Niger, after successful democratic transitions, to bury the hatchet and move forward as united peoples. Gambia called on the international community to provide all the support needed as those countries tried to bring peace and development to their peoples. Turning to development issues, she said it was evident that Gambia was on track to meet some of the Millennium Development Goals, but continued to struggle to meet others. International donor support remained the crucial element in its efforts. The Government had, therefore, embarked on a new Programme for Accelerated Growth and Employment which it believed would be generously supported by its partners. In light of the impact of the continuing financial and economic crisis on least developed countries, it was equally urgent that the implementation of the Istanbul Programme of Action be fully supported. The Gambian Government also called on the emerging economies of the South to enhance their cooperation. At the same time, meaningful partnerships must be forged across the North and South to bring food security, tackle youth unemployment through education and skill development, and enhance the quality and coverage of healthcare delivery systems. Moreover, “ Rio+20” should be about implementing binding commitments. Voicing support for Libya’s National Transitional Council, she expressed additional support to the Arab League, the Organization of the Islamic Conference and the Gulf Cooperation Council in finding peaceful resolutions to the conflicts unfolding as part of the “Arab Spring”. Gambia also saluted the role of the African Union in peacefully ending disputes. Further, it not only supported but recognized an independent and sovereign Palestinian State within the confines of the 1967 borders. The Gambian Government condemned those who turned themselves into suicide bombers or conducted inhuman behaviour in the name of Islam, in contravention to that religion’s values and teachings. It also called on the international community to encourage and support the Syrian Government and people in resolving their internal problems through diplomacy and peaceful means. Stressing that the Nagorno-Karabakh conflict must be addressed without further delay, she added that the United States must lift its sanctions and embargo on Cuba now. Finally, the United Nations should immediately find a suitable way to allow for Taiwan’s meaningful participation in the specialized agencies and mechanisms, she said.